How would you like to wow your audience with the most exciting and mystifying entertainment ever!? Guaranteed! Look no further than Diego. 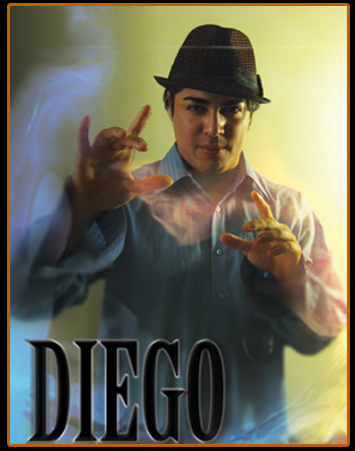 Diego is quickly becoming one of the most popular Magician/Hypnotists in the country. Voted the Nation Capital’s Best Illusionist, Diego’s show is a fast paced spectacle of laughter and excitement that is appropriate for all age groups. He has performed for fortune 500 companies, the International Magic Festival and has had numerous television appearances over the past 10 years. His reputation speaks for itself. During the show Diego will selects volunteers from the audience to come on stage and be hypnotized. The hypnotized audience members are taken through an amazing voyage of imagination and become the true stars of the show. All performances are done in good taste and may be custom designed to fit your specific needs. Diego specializes in Corporate Events, College Shows and High School presentations. Apprenticed by the best known hypnotist in the world Sailesh, Diego learned everything he could about the stage aspect of hypnosis. Desiring to do more then just entertain Diego has went on to learn hypnotherapy to help people with their phobias, addictions and problems. With several different options to choose from, Diego's unique brand of entertainment is a guaranteed hit for your next event!